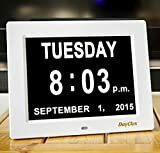 A day clock that tells the day of the week, time of day, and the date can make life much easier for a senior citizen friend, especially one with Alzheimer's or dementia. I first found out about day clocks when I was researching a way for my Mom to feel more comfortable knowing what day it was. 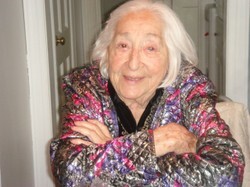 The bonus of having a day clock in my house was also that I, as her primary caregiver, also knew what day it was. There were literally days on end where I had no clue if it was Monday, Tuesday, etc. I prefer the digital day clocks as, sometimes, those with Alzheimer's or dementia lose the ability to tell time on a regular clock but reading continues as normal. A digital day clock gives easily shows the time in digital format - this is a much easier clock to read for senior citizens as there's no clock hands to try and figure out. Analog day clocks. Analog day clocks are round, like normal clocks. These day clocks can be confusing to those senior citizens with Alzheimer's or dementia as the hands may make it difficult to read the clock. GoodGiftsForSeniorCitizens.com has a very nice selection of day clocks. Digital day clocks. I much prefer a digital day clock as it takes the guesswork out of telling the time. I actually bought an analog clock first and returned it for my digital day clock. I'm much happier now. Dementia Digital Calendar Day Clock / with Non-Abbreviated Day & Month. This day clock tells the day of the week ONLY. Does your elderly loved one need to know whether it's day or night? If so, this Dementia Day Clock is the only one I could find that reads out 'It is now morning (evening or night). Where will the clock most likely be placed? If it's on a wall across the room from the favorite rocker of your senior citizen friend, go with the digital every time. It will be much easier to use from a distance. How bright do you need the readout to be? Some day clocks are very easy to read. On some of these types, the light can even be dimmed so reviewers use them as night lights too!